By Dan Ambrose: Chad Dawson might not be too pleased to read WBC light heavyweight champion Bernard Hopkins’ interview today with RingTV where the 46-year-old Hopkins is saying he wants to unify the division by facing WBO champion Nathan Cleverly and WBA champ Beibut Shumenov. Hopkins says if the money isn’t there for a Dawson fight, which he says there isn’t right now, he might vacate his WBC title if need be rather than take on Dawson and make good money. Hopkins says he hopes that Dawson will understand that it’s not a good idea to make the Hopkins-Dawson II fight if the money isn’t there for it. 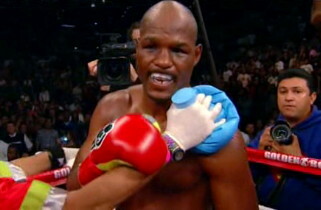 I think Hopkins doesn’t understand why Dawson wants the rematch. Dawson wants it for the fame he’ll get for knocking off Hopkins, as well as to recapture his WBC belt. I think Dawson is okay with not getting big money for that fight, because he knows it will lead to bigger payday down the road. Hopkins goes on to say he doesn’t think anyone will put up the money for a Dawson-Hopkins rematch and he doesn’t think it will bring in a lot of money. Hopkins says he thinks Dawson will want to make more money than what he would get in a second fight with him. In other words, it sounds like Hopkins is hoping Dawson will change his mind about wanting to fight him again so Hopkins can go on a fight Shumenov and Cleverly, while at the same time keeping his WBC title. That doesn’t exactly sound like a good deal to me for Dawson. Not only does Dawson not get the Hopkins rematch, but he also loses out on his shot to try and recapture his title. I think Hopkins is kidding himself if he believes Dawson will just drop his demand to get a rematch after the World Boxing Council already mandated that Hopkins has to fight Dawson next. Of course, anything is possible when it comes to the WBC, as we’ve seen with them changing their minds about Julio Cesar Chavez Jr. having to fight Sergio Martinez next after they already ordered that Chavez Jr. has to fight Martinez next. Hopkins says there are not a lot of people demanding the Dawson-Hopkins II rematch like there is with the Manny Pacquiao vs. Floyd Mayweather Jr. fight. He goes on to say that he will try to make the Dawson fight but if it doesn’t make business sense, he will vacate his WBC belt rather than fight Dawson again. Hopkins again said he doesn’t think he’ll have to vacate his belt, meaning Dawson will give up on the idea of facing him. That’s pretty sad if you ask me. I think Hopkins is going to have to vacate the title because Dawson wants the rematch and the WBC title belt. He doesn’t want to be left with nothing just because it’s convenient for Hopkins.